Common Name: Morus branch, Mulberry twigs. Part Used & Method for Pharmaceutical Preparations: The tender branches are gathered at the end of spring or the beginning of summer; then they are dried in the sun and cut into slices. Functions: 1. To dispel wind and dampness; 2. To clear the collaterals. Indications & Combinations: Wind-damp obstruction syndrome manifested as rheumatic pain and spasm of the limbs. 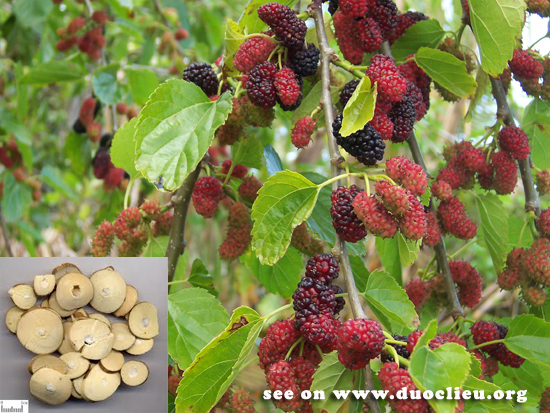 Mulberry twigs (Sangzhi) is used alone or with Tetrandra root (Fangji), Chaenomeles fruit (Mugua) and Chinese starjasmine (Luoshiteng). Cautions & Contraindications: This herb should be used cautiously in cases with deficient yin syndrome.